Sure Stop Disc Brake Kit for large brake drum (11-1/4 o.d.) and Wire wheels. 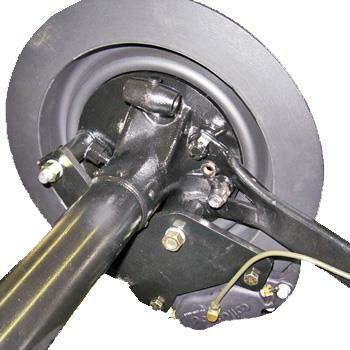 The Sure Stop Disc Brakes are custom made for Model T's with new one-piece spun steel brake drums with large 15" brake discs for substantially increased braking power. These brakes proved to have better braking power even under WET conditions. Unlike some of the other accessory brake systems, these still work when rolling backwards. This braking system is used in addition to the original Ford transmission brake which remains active. “Bolt-on” installation requires no cutting, drilling or welding. The kit only requires modifying the brake pedal to allow linkage for a master cylinder. We will need you to send in the appropriate brake pedal for your car for us to attach the tab for activating these brakes. The location of this tab is critical to the operation of the system and we cannot provide disc brake systems without this procedure. Once your order is placed, we will advise you where to send your brake pedal so that it can be modified and sent back with the brake kit. 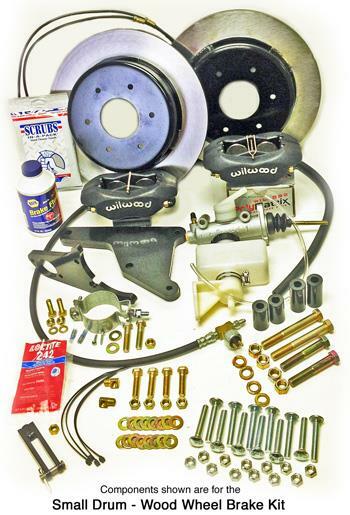 The kit includes all the parts you will need to install the kit on both of your wheels, including; 2 New Brake drums with the discs attached, Master cylinder and bracket, 2 Calipers and brackets, Brake Pads, Steel Lines, and Mounting Hardware and instructions. It also includes a reliable brake light switch.